Bringing a puppy home is an exciting time. Don't let the stresses of house-breaking, socializing and training overshadow these special months. Enjoy this time and build a foundation for obedience early on. Keep your dog from jumping on guests and chewing up the furniture. This program teaches your dog to respect your home and to stay calm around visitors. Being outside should be a pleasant and controlled experience for both you and your dog. Keep your dog safe and put an end to embarrassing trips out in public. 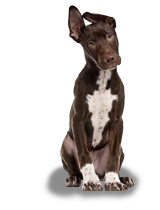 From excessive barking to aggression, zero-in on what's causing specific behaviours. By understanding the causes, a custom program can be designed to correct the problems at its roots. I first started working with Sit Happens in the summer of 2001. 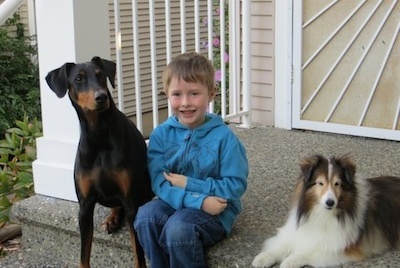 At the time I owned two Shelties, Sabina at 5 year tri –coloured and Roman a 3 year old blue merle.During the first year and a half of his life, Roman had experience 6 different traumatic events that led the gradual development of fear aggression. By the time I met Jeff and Marilyn, he was a mess. We could no longer go for walks without him lunging at people – after they had walked by. At my grooming shop he would jump at the gate and try to bite. He would run out the front door any chance he got and anyone entering our house was a fair target. My husband and I did not know what to do. We started to work with Jeff and it did not take long for us to see a dramatic change in his behavior. Once he realized that we were in control and he no longer had to worry about situations, he calmed down and we no longer had to fear his reacting to events or people. We were so impressed with the results that we got with Roman that we decided to go through the program with Sabina as well. Even though she had already been through 2 levels of obedience training and had her Good Canine Citizen certification, I felt it would be a good “refresher” and strengthen our bond and make her more reliable off leash. We were not disappointed. I had 2 beautiful reliable dogs that I could take anywhere and be well behaved. 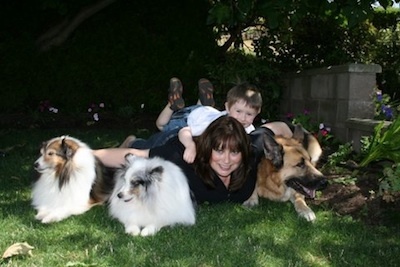 In the fall of 2003 I added a third sheltie to the mix – Molly a 4 year old sable rescued through Sheltie Rescue. A free spirited but well trained dog I worried about her bonding with me. I would call her while out for walks, she would look at me and think about whether to follow or continue going about her own business. I returned to Sit Happens. I knew it was the best way for her and I to develop a relationship and a sense of trust. It didn’t take long and she was following at my heels with the other two shelties. In the spring of 2004 I had the fortunate opportunity to add to my pack again. I adopted an amazing German shepherd named Tango. Already trained by Sit Happens, I continued to work with him, once again to develop our bond and relationship. He loved working and got such joy out of the classes. The more I asked of him, the more he wanted to please. With 4 dogs in the house there is no room for guessing. You must instill a sense of trust and respect in your dogs if you wish to maintain a balance among them. 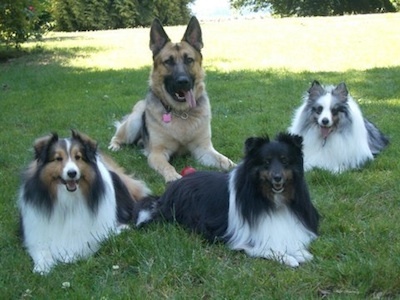 For many years, thanks to Sit Happens, I had a pack of well behaved, outgoing and social dogs. 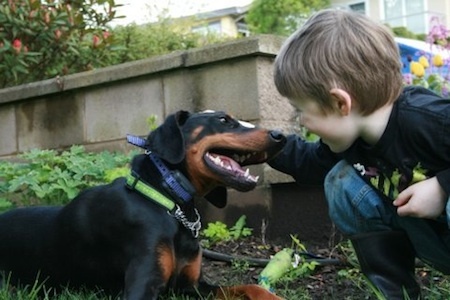 In February 2012, I received a call from Marilyn asking if I would consider fostering the 20 month Doberman that she had fostered the previous year. After a short time with a family, Hope was being returned to foster through no fault of her own. I agreed. I had met Hope when Marilyn had her – a shy, nervous but beautiful dog. When Marilyn first picked her up for rescue, she was fearful of anything new. She had never been off of the acreage where she had been born and the sounds of the city were overwhelming to her. She had also never been on a leash and was afraid of tile and wood floors. She attached herself to Marilyn and wouldn’t leave her side. Marilyn acclimatized her to as much as possible in the 2 months that she fostered her. When I took her in six months later, she was still a bundle of nerves. For the first few days she would only come out of her crate to eat and relieve herself.Slowly we worked on getting her use to the house, the floors, the neighborhood, children at school. She was now literally attached to my leg, often making walking difficult, and never ventured very far from me. She would not let you touch her back and hung her head whenever you went near her. And she was incredibly unsure when meeting other dogs – playing with them was not an option. When it became obvious that I was a “failed” foster parent and Hope would be staying with us, we began training, for the 5th time, with Sit Happens. But this time it was different. Hope had no attachment with me or prior obedience training; she was fearful and nervous of all new situations and ready to bolt if frightened. We had many more obstacles to overcome than I had had with the previous 4 dogs. But with the guidance of Jeff and Marilyn, I began to work with Hope. 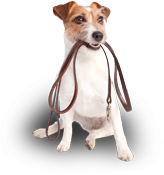 First on the basics – come, sit, place – and then onto heal, down, and off leash work. Just being in class was an extremely stressful situation for her. The close proximity of so many other dogs would make her shake and she would rush to my side any chance she got. But she caught on quick and as her confidence grew, a transformation began. In what seemed like no time, I had a dog that was walking enthusiastically by my side – no longer attached to my leg and with her head up.Children at my son’s school were able to come close without her wanting to hide and she began to let us pet her. Slowly she began to enjoy the company of other dogs and started to play with a few “dog friends”. As we celebrate our first year with Hope, we look back and are amazed at how far she has come. 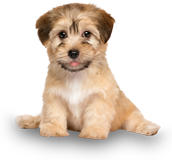 She is outgoing, socialable, with both people and other dogs, loves to be touch and is incredibly obedient and trustworthy. Recently as I watched my son and Hope play, it occurred to me that Sit Happens had done it again. 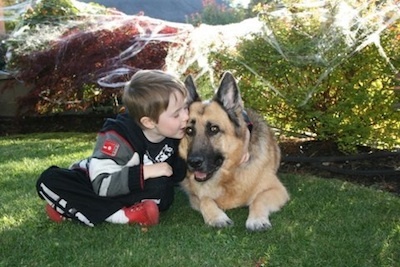 They had provided me, and my family, with the skills and tools needed to develop a life long bond with an amazing dog. Thank you Sit Happens. I will let you know when it is time for #6…..
Burnaby, Vancouver, North Vancouver, West Vancouver, Port Moody, Coquitlam, Maple Ridge, Pitt Meadows and Port Coquitlam. Follow this link for Additional resources for dog owners.